custardino: Should they stay or should they go? After a few weeks of feeling hopelessly overwhelmed and not knowing where to start, I have this week begun to clear my small spare room, in preparation for some major sorting-out. This has meant no thrifting. I have really missed it, but clearly I have enough tat and should not be allowed any more until I have regained control of the room. It was good to be re-united with some of my vintage sewing supplies, boxed up for nearly 2 years since my house move. These are just the pink ones, I have loads of old wooden cotton reels. I'm never going to sew with them, they are beautiful, but there is nowhere to display them, and whereas they looked great displayed in my previous Victorian property, they don't quite work in this 50s house. So, should I pack them up and keep them or give them a go on ebay? All advice gratefully received, as usual. Hope everyone else has been out and about finding thrifty treasures, not barricaded in a small room by boxes! Oooh, they are pretty. Can you get a big glass canister or apothecary jar and display the lot in that? I would hate to part with them, so if you can't display them, I would pack them up until you can. I would keep them, they are lovely colors. I with you on feeling overwhelmed with stuff. If you can't display them or use them I would sell them on. Better then having them stored away and somebody else can enjoy them! "After a few weeks of feeling hopelessly overwhelmed and not knowing where to start, I have this week begun to clear my small spare room, in preparation for some major sorting-out. .......clearly I have enough tat and should not be allowed any more until I have regained control of the room." They are lovely, but then presumably that can be said about a lot of your thrifted 'clutter'. If you really won't use or display them, I suppose you should sell them on. Thanks to all of you for the advice. @ trashsparkle - Every time I read your blog I wonder if we were somehow separated at birth! I, too, am drowning in 'collected clutter' and am having to whittle it down a little! It's very difficult parting with beautiful things. 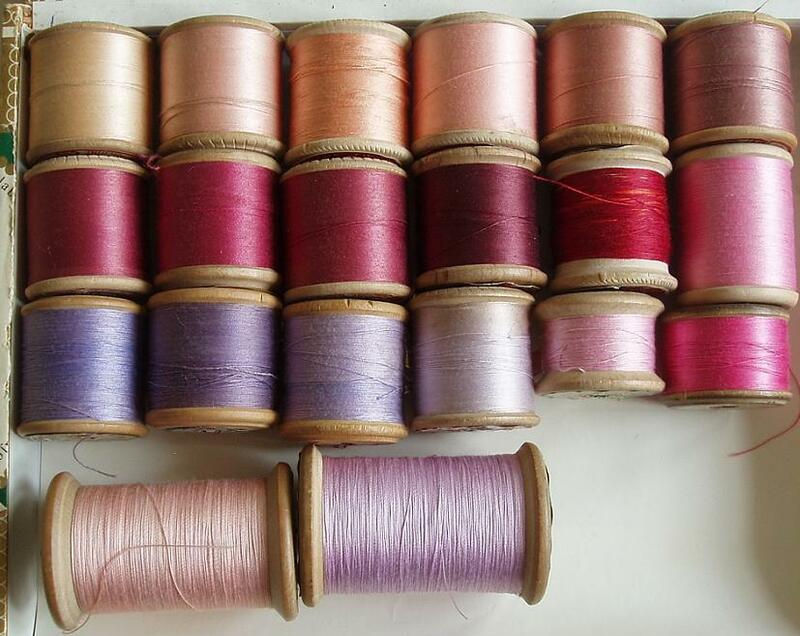 I also have over 100 cotton reels and have sorted them into rainbow colours. They are not on show - no space to show them, but I don't want to part with them. DH is decluttering his garage but we both agree that as soon as you throw anything out you will immediately need it. So my advice, if you still need it, is keep them - until the next declutter time!